You can help improve the lives of children with disability. Donate now. Seeking answers and solutions for developmental disability through early intervention practice and research. Help me realise my abilities so I can be ready for school. I need lots of special therapies. Donate online or collect donations for my Riverwalk Campaign. Your donations will support a positive foundation to the best possible life for Vida. Hi I'm Vida. I am four years old and I love to go to kindy and playing with my puppy. I need to spend lots of time doing my therapy exercises so I can be ready for school. You can help my team to fundraise by donating online, joining in our fundraising campaigns this year and following my story on Facebook. We would like Vida to believe anything is possible and that she can achieve anything she wants. Vida was born on a stormy Australia Day in 2012. 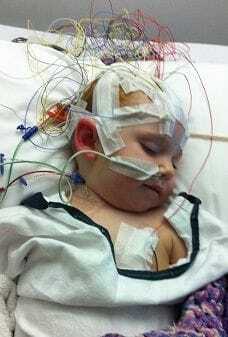 Seven weeks later she presented with infantile spasm (an uncommon form of epilepsy). Vida was diagnosed with hemimegalancephaly a rare brain malformation. With some heavy implications. The removal of half her brain. Vida experienced sometimes hundreds of seizures a day and spent far too much time in hospital. At 13 months, Vida underwent an extreme 20 hour surgery to remove the right hemisphere of her brain in hope of reducing seizure activity. The brain is amazing, rewiring neural pathways to compensate the process is known as plasticity. Early intervention is vital to Vida's rehabilitation and to date we are really seeing great "steps" forward. My family and friends have pooled our resources which are now exhausted. This is such a critical time in Vida's development and we are really motivated to continue to give her all the opportunity to progress as far as she can which at this stage is really unlimited. 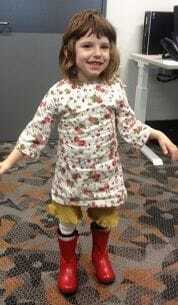 She is four and has been learning to walk without assistance with the help of her therapists. She knows hundreds of words and is starting to form sentences. Our dream for Vida is to attend a mainstream school. Preparation for school is moving forward,. There is still so much work to be done. Sponsor our team for the annual Riverwalk Event by pressing "donate now" button on my webpage and receive an automatic tax deductibe receipt. You can read about the event and register to walk for our team at the events pagehttp://www.developingfoundation.org.au/upcoming-events.html. Help us raise sponsorship for our team through participation at the Annual Riverwalk event by collecting donations on our behalf. Send this page page to your family, friends, colleagues and anyone else you can think of and invite them to donate. Vida, you are such a delight to know. You have achieved so much in your four years and your future is full of exciting possibilities. Can't wait to watch your journey. Big love to you Vida! Copyright © 2019 The Developing Foundation Inc.